German Quote: "Hopfen und Malz Gott Erhalt's"
Perfect for serving 6 bottles on ice, this novelty bucket is made from high quality galvanized steel and features a solid wood handle. Makes a creative and unique Mens Gift, Father's Day Gift, or Birthday Gift for German Lager Lovers. 7” high, 9.5” top diameter, 6.5” bottom diameter; weighs 1.35 lbs (.62 kg). Our nominal 6 qt bucket nicely holds six 12oz bottles with room for ice; its capacity to brimming is 5.56 qt (5.26 liters). 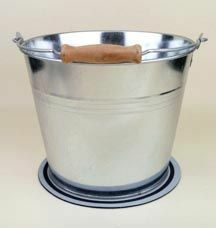 Our buckets are made from heavy-duty, top quality galvanized steel. Each bucket has a reinforced molding band for strength, and a heavy-gauge bale with solid wooden handle. Graphics are produced using a digital process which thermally prints onto an all-weather 3M Scotchcal clear vinyl film. The film is then permanently bonded to the bucket's steel surface, and is resistant to wear, water, temperature and light. This method allows for greater detail, more vivid colors and longer durability than many other processes. The Capcatchers bucket coaster is designed to contain the condensation from your ice-cold bucket of beer. Made from 2mm neoprene, it is perfectly sized to fit our 6-quart beer bucket. Better yet, it features a non-skid, moisture barrier backing to protect your table surfaces. It is the perfect addition to an already awesome gift! 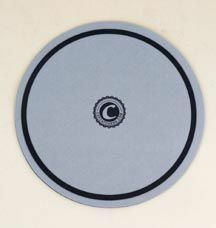 Coaster diameter: 8 inches. Color: Gray.